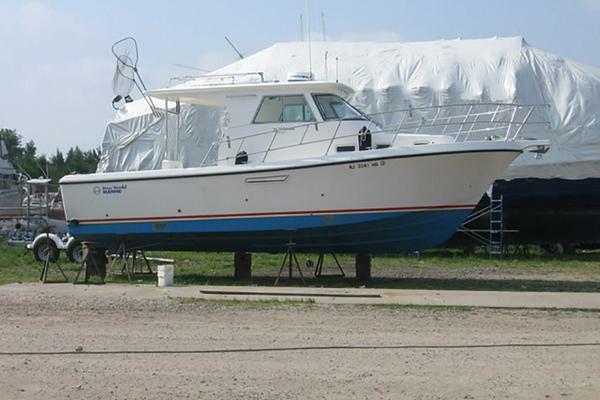 This 1974 classic has been lovingly restored and shows as if she were new. The exterior boasts a new Awlgrip paint job. The boat has all new wiring throughout that includes a new electrical panel. The Detroit 8V71 TI engines were removed and completely rebuilt, she currently has 400 hours on the mains. New generator with 70 hours. New headliners throughout, new lighting, Corian countertops, teak holly flooring below, all teak sanded and varnished, every hinge on the boat has been replaced, new diesel furnace in winter 2013. This is a boat that is a must see to appreciate the attention to detail that was put in to the refit.